Almost all products releasing in the beauty world nowadays claim to be long-wearing, ultra pigmented and multi-functional. However, when put to test almost all fail to live up to their outlandish claims of being budge-proof and 24 hour long wearing. Bouncy-to-the-touch, these unique, radiance-enhancing highlighters are gossamer-light and melt into skin for a barely-there feel. Ultra-fine, light diffusing particles help skin look lit from within with a soft, luminous, natural-looking glow. This brilliantly long-wearing sparkle eye shadow combines the perfect mix of pearl and glitter to lavish eyes with incredible luster and shimmer. With its uniquely lightweight, water-infused texture, Glitter & Glow glides on effortlessly, then dries down smoothly, locking in maximum sparkle with minimal fallout, for eyes with a real “wow!” factor. But who would be better to judge it properly than the YouTube guru who loves all things glitter. Here is a detailed review and swatches of stila – Magnificent Metals Glitter and Glow Liquid Eye Shadow by Tati from GlamLifeGuru. The ingenious two-in-one lipstick and blush is loaded with creamy, translucent color—for simply irresistible lips and cheeks—on the double. This makeup bag must-have features a fresh burst of radiant color that blends beautifully to create a gorgeous glow. For easy application to cheeks – press your ring finger into cream and gently rub against thumb to warm up the color – then tap color into cheeks, blending outward and upward. It’s yet another favorite of a number of beauty bloggers and has been for a long time now. Anna from The Anna Edit and Makeup Geek’s Marlena Stell both love the blush and have featured it in their top favorites of all times. For dark skin tone, Marlena recommends stila – Convertible Color in Peony – Brownish Rose. Anna, on the other hand, prefers the shade Gerbera – Rosy Peach Pink. 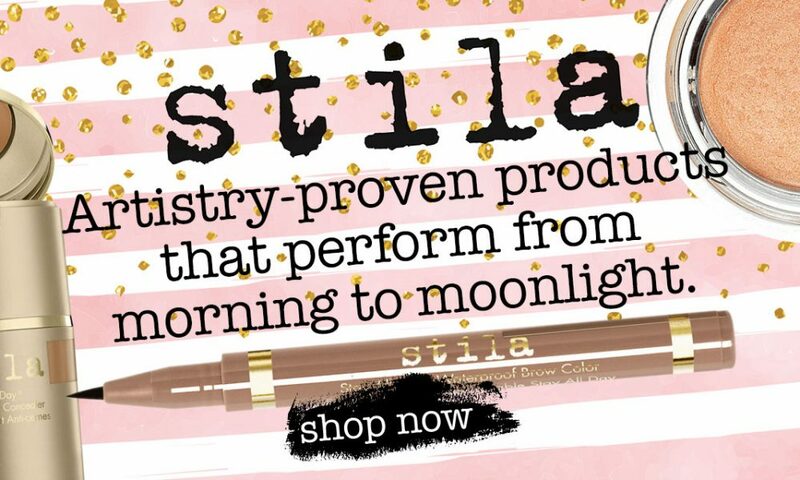 Stila’s bestselling Smudge Sticks are available in an array of matte and shimmer formulas that stay—not stray—for reliable color payoff that’s second to none. With a range of gorgeous shades to choose from, they feature a cocktail of moisturizing ingredients that ensures color glides on smooth (no tugging or pulling) and the waterproof formula won’t budge or fade. Trace along upper and lower lashes to use as an eye liner. Smudge Sticks can also be used as a classic pencil liner or a smudgy eye shadow – simply smudge with your fingers or a brush. The color sets after you’ve had time to get your desired effect, and then stays put all day. Suzi from StyleSuzi featured it in her Top 5 Waterproof Pencil Eyeliners of all times. Check out the swatches below and how the liner fares under running water for the ultimate waterproof test. Swirl your way to perfect skin in one step! This innovative, triple-swirled helix serum instantly primes, color-corrects, brightens and nourishes skin for a flawless face with no fuss. The revolutionary product contains 3 color-correcting pigments to even out complexion. Supercharged with Stila’s proprietary Youth Revival Bio-Available Mineral Complex™ to help hydrate, control oil, and diminish the appearance of pores and fine lines. Take a pea sized amount at the back of your hand. Using your fingertips, apply stila One Step Correct Serum all over your face using light patting motions. The ultimate power pout! This creamy-matte, full-coverage lip color delivers bold, long-lasting color and stays in place for up to 6 hours of continuous wear. The texture is weightless on lips and comfortable. The color-rich formula will not bleed or transfer. Choose from a range of shades including Patina, Baci, Biscotti, Fiery, Bacca, Rubino, Amalfi, Aria, Fiore, Amore, Beso, Perla, Carina, Notte, Tesoro and Bella. Previous Post Vitamin Dictionary: Which One Is The Best For Your Skin?